Cyril Owen Brandt is a PhD candidate with the International Development Studies programme at the University of Amsterdam, within the Education and International Development ISAcademy research group. His research is on the role of education systems in processes of state formation in the Democratic Republic of Congo (DRC). In his PhD thesis, he looks at problems around teacher identification which have persisted in the DRC since the 1970s. For the 2017 UKFIET conference, 23 individuals, including Cyril, were provided with bursaries to assist them to participate and present at the conference. The researchers were asked to write a short piece about their experience. An increasing number of donors, implementing agencies and NGOs support the delivery of education for internally displaced people, and also provide assistance for internally displaced teachers. Despite this mounting attention, there is little to no evidence and academic analysis on teachers’ working conditions during protracted or recurrent internal displacement. 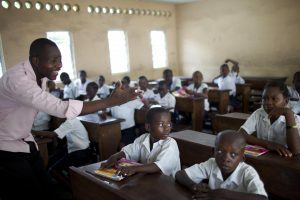 Through qualitative fieldwork in the Democratic Republic of Congo (DRC), I am shedding light on the challenges of teachers in one particular armed conflict. Armed conflict has had massive negative impacts on the provision of education in the DRC. Northern districts in the province of Haut-Katanga have been subject to a recurrent armed conflict since the early 2000s. The most violent periods occurred between 2001 and 2006 and from 2011 to 2014. Very few pieces have provided qualitative insights into the delivery of education in these particular circumstances. How were schools opened in these districts? Why are teachers attacked and displaced? Why do they return to their villages despite ongoing tensions? I argue that it is necessary to carefully explore these questions in order to acquire a more comprehensive understanding of teacher identity and agency in a recurrent armed conflict. In order to do so, I conducted 150 interviews with teachers, principals, educational administrators and staff of NGOs and donors in the two districts under study. I combined these with interviews at provincial and national level. The first question I raised above might seem rather trivial but I argue that it deserves attention. The region under study has historically been neglected in terms of access to schooling. It is only since 2004 that an astonishing number of public primary and secondary schools has been opened. As I explain elsewhere in more depth, these openings are not subject to any planning procedures (Brandt, 2017). Instead, they are the outcome of the brokerage of politicians and administrators. My research reveals that processes of formal democratisation have strengthened these informal processes. This leads me to a first ambivalence of state practices: in a regional context of recurrent armed conflict, informal political processes have led to a stronger territorialisation of the state in the form of new public schools. With regard to my second question, my findings suggest that teachers are attacked due to their allegiance to the state. The fact that they are literate and frequently travel outside of their villages can turn them into ‘politicians’ in the eyes of the militia. Third, teachers return for a variety of reasons. Intrinsic motivations, high prices for food during displacement, but also the administration’s order all play an important role. Educational administrators have a say in teachers’ re-deployment. My findings suggest that they enforce returns by threatening to withdraw teacher salaries. The material conditions teachers are working in are very precarious. Thus, teachers can become ‘front-line actors’ (Wilson, in Hansen & Stepputat (Eds. ), 2001) who signal a return to an odd form of normalcy to the rest of the population. Despite the fact that the Congolese state is not performing well in many instances, it is far from being absent (De Herdt & Titeca, 2016; Trefon, 2009). Such a perspective adds complexity for policymakers, but I believe that it prepares them better for encounters with teachers, understanding them in their multifaceted ways instead of assuming neutral implementers. Certainly, more research in this field is needed.